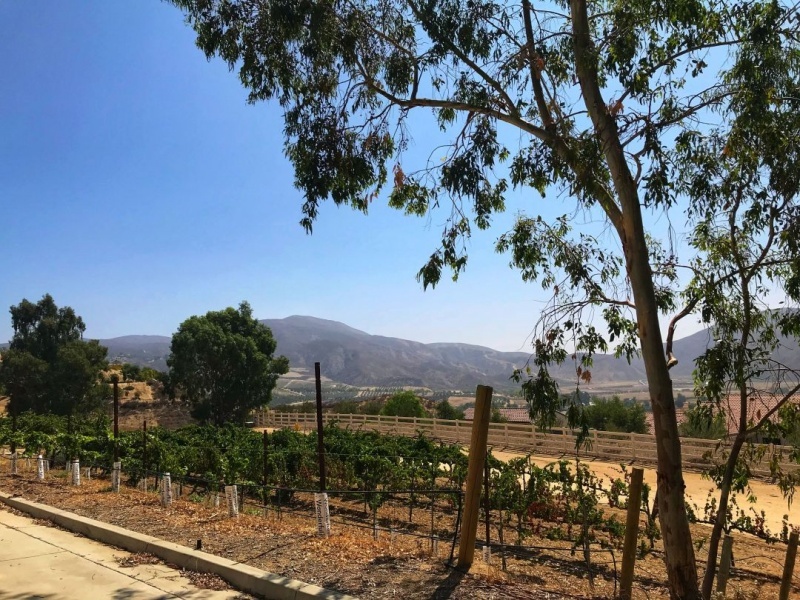 In this, the first of our posts focusing on the wineries we visited during our recent trip to Temecula Wine Country, we describe our experience at Baily Vineyard and Winery. 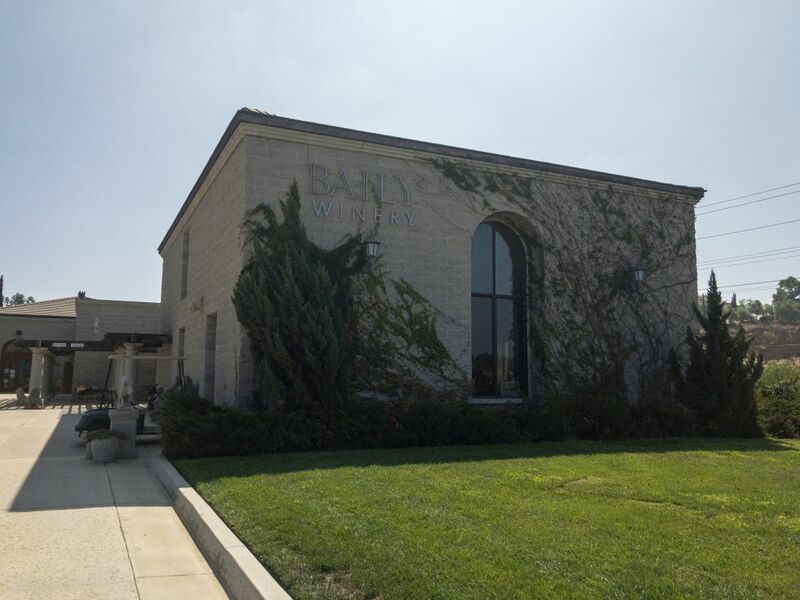 Baily has two locations in Temecula. 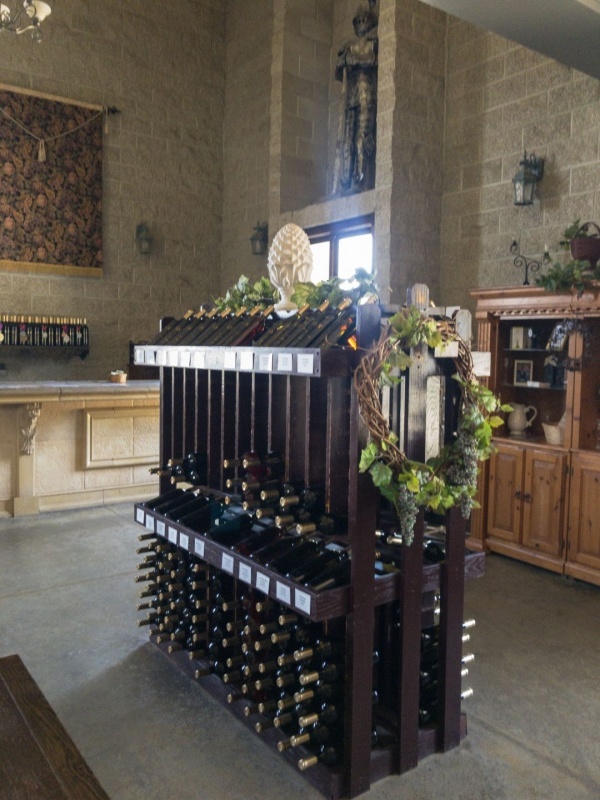 The main tasting room is on Rancho California Road, as are several other Temecula wineries. A tasting at this facility is $15 and reservations are not required. 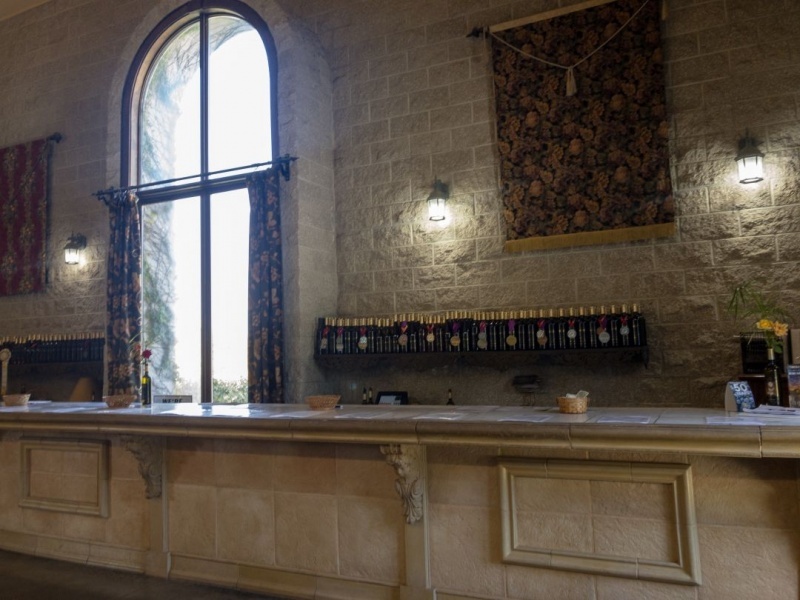 Reservations are required to visit the tasting room in the actual winery; where a $30 fee enables you to do a vertical tasting of Baily’s library wines. It was this latter offering that we sampled with six Cabernet Franc from 2008 through 2013. Pictured is Phil Baily as he spoke to us about Temecula and being a winemaker in the area. We were met at the winery by Phil Baily; the owner and winemaker. 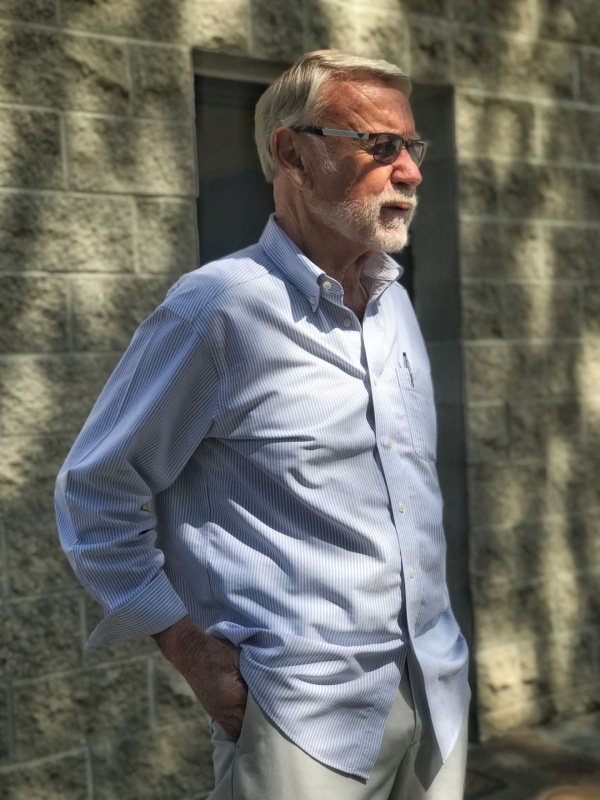 Phil and his wife, Carol, moved to Temecula in the 1970s, originally to grow grapes He started the winery in 1986 and by the nineties, he was making a living from the business. Phil said that the most important lessons he had learned in his twenty plus years of winemaking were: “Don’t screw up” and “Keep things clean”. Amber comments: I instantly liked Phil. He’s an old-school gentleman who likes things done the right way. He was very interesting to speak to and was a fountain of knowledge when it comes to Temecula terroir and climate. 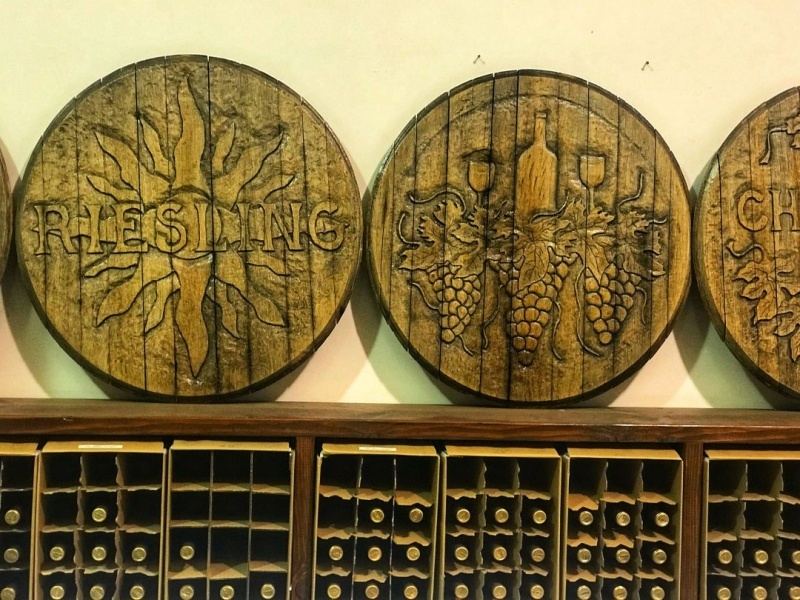 Pictured old barrel tops that have been custom carved and serve as decor in the barrel room. Phil Baily uses mostly American oak barrels. The Cab Franc spends thirty months in a fifty-fifty mix of new and used barrels. He holds back about one-hundred cases of his Cabernet Franc, Cabernet Sauvignon, and Meritage. This allows him to offer the vertical tasting experience and sell these older wines. The current release for the Cabernet Franc is 2014 and it sells for $35. The older vintages are $5 more for each extra year. Our glasses were set out for us for this vertical tasting. Amber, Pam (Always5Star), and I sat around a table with Phil. In front of us were six glasses on a white placemat with the vintages written by each glass. A plate of cheese and meat was provided, along with water. 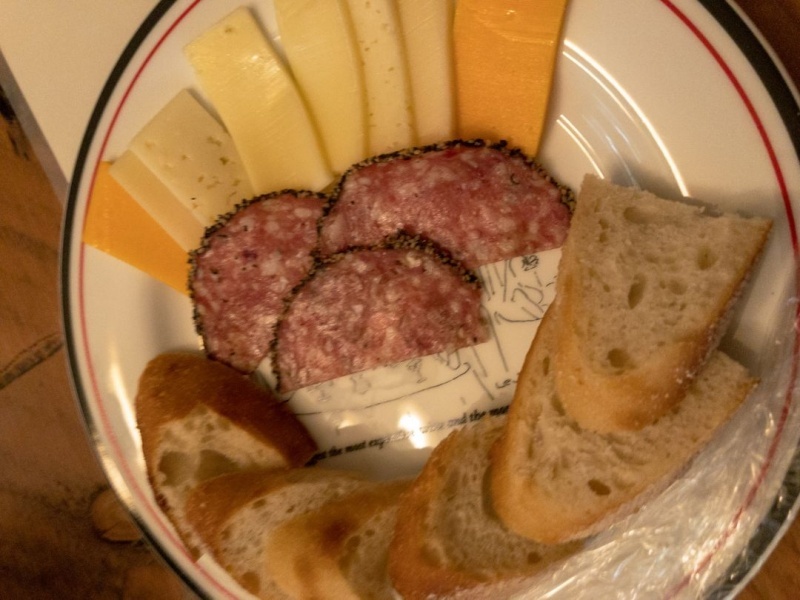 A meat and cheese plate was set out for us to help clean our palates between each tasting, but also to help us taste the wine with food when often enhances the flavour. The 2008 provided an intense nose of plum and anise, with a floral backing. The wine was medium-bodied with excellent acidity and flavours of cigar box and cherry. Amber comments: I really enjoyed the 2008 but it was a tad on the soft side for me, not quite enough structure there to win my palate over. It’s delicious and ready to drink. I would suggest this be consumed with cheese for your best pairing. The saltiness of the cheese will bring out all of those beautiful ripe fruits in the glass. The wine felt very feminine to me and easy to drink. The 2009 had a nose light on fruit, dominated by aromas of brown sugar and wet cedar. Once again there was a delightful acidity with flavours of cherry and tobacco. The tannins were softened by age. Amber comments: The reason this vintage won out for me over the others is that it still had lots of flavor with great balance and every note seemed harmonious in my glass. It still carried enough structure without being bland or flabby. This is perfect and ready to drink. The 2010 had a complex nose over which I lingered: cherry, green pepper, toffee, and damp wood. The acidity on this vintage was even more distinct than in the two earlier vintages, but still in balance. Flavours of cherry and liquorice were backed by well-integrated tannins. Amber comments: I liked the 2010, but I just didn’t feel like it had the extra X factor that the 2009 did. 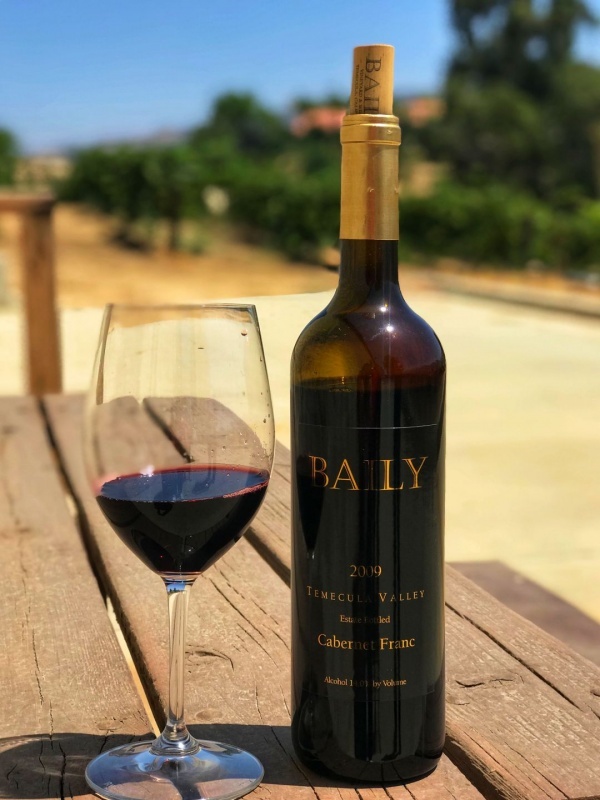 Cheers to Baily Cab Franc! It’s delicious. The 2011 had a nose led by a punch of cherry with soft wood notes in the background. Taking a sip I was struck by a heightened acidity, a mix of raspberry and cherry, and moderate silky tannins. This was the most complex of the six vintages. Amber comments: The 2011 was remarkably different from the other wines in the lineup. This had plenty of tannins going on in the glass and a lot more structure. This felt like it was far more masculine and bold in the glass and it is definitely crying out for a big piece of meat to go with it. The 2012 had an aroma in which fruit was more pronounced than in the older vintages. Taking a sip I found bright cherry and the tannins were more pronounced. Amber comments: I liked the 2012, but compared to the others it just felt too young. The good news is that it will age beautifully but it is still ready to drink now if you wish to. Just decant it for a couple of hours to get the best out of it, if you are going to drink it immediately. Views from the winery/estate. Absolutely beautiful! The rich nose on the 2013 was cherry forward, with backing notes of wood and anise. The wine had a slight sweetness that led to cherry and pepper. This wine won best red from the South Coast at last year’s California State Fair. Amber comments: I have to admit, the 2013 was great for how young it is. Bright and bold and ready to meet the world head-on. I thought it was a great representation of its grape too. 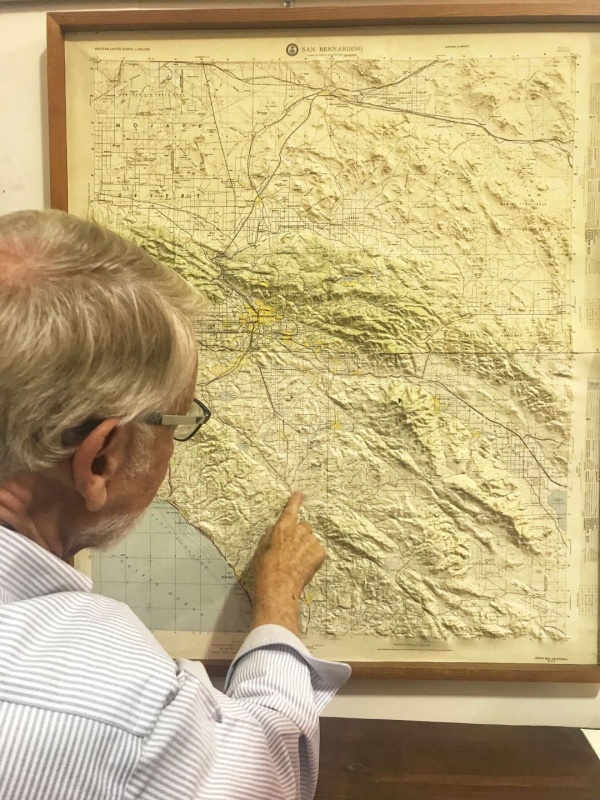 Phil showing us the terroir of Temecula and explaining how the cooling breezes are sucked in through the valley by neighboring Palm Springs. After the tasting, Phil Baily asked us which had been our favourite vintage. Pam nominated the 2008, Amber selected the 2009, and I went for the 2010. Lisa, the Estate Club Director, told us that the 2011 was her favourite. This lack of agreement speaks to the quality of all of the vintages; they all had something to offer. All of the vintages reflected an old-world approach to wine; complex with no attempt to overload with fruit. Amber comments: Just to note here, Lisa confirmed that my pick, the 2009 was the most popular choice amongst the general public. Not that I am bragging or anything! I would highly recommend the Baily library tasting experience. 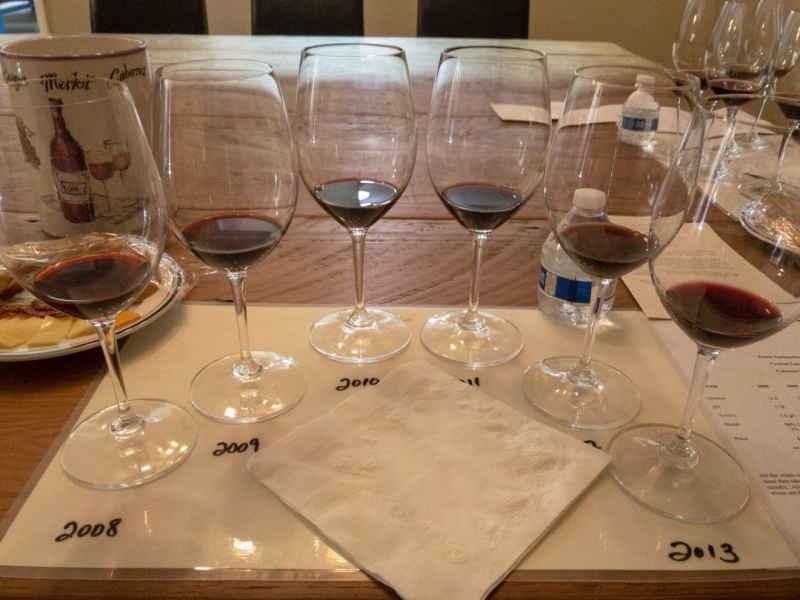 Tasting the same wine across multiple vintages can be very educational; seeing how a wine changes across time; the acid and tannins more pronounced in the younger wines. There are not many wineries that offer vertical tastings to the public on a regular basis. An added bonus is the very reasonable $30 fee. 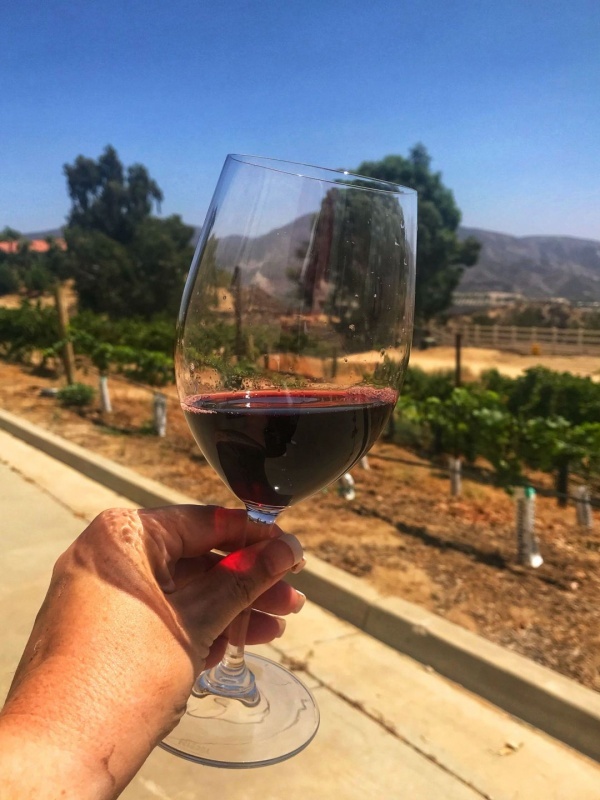 Amber comments: What a fantastic start to our tastings in Temecula! I was so impressed by the quality of the wines at Baily. I also loved the warmth and hospitality we were shown. This is a winery we highly recommend for everyone to visit.